"Christmas with the Ellisons" was provided to the public free of charge courtesy of the N.Y. S. Office of Parks, Recreation, and Historic Preservation, and consisted of a tour of the 1754 Revolutionary War home of Col. John and Catherine Ellison. The Georgian-style stone Ellison house located off Old Forge Hill Road at the intersection of Rt. 94, in Vails Gate, was used as Continental Army Artillery Headquarters by Major General Henry Knox, Commander of Artillery Forces. The tour was held between 5 and 8 pm Saturday-December 15th. The tour was well attended and all who participated in the visit to the residence were treated to a rewarding, historically enriching, educational experience. 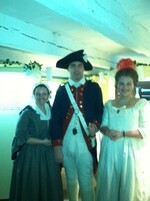 NYS Park representatives were all in period dress or Revolutionary War era military uniform. Everyone present thoroughly enjoyed a truly inspiring visit to our local historical past.